Help early elementary children experience God's great love by bringing his story to life! Based on the thirty-one chapters found in The Story for Children, engaging lessons are formatted around relatable Scripture references, memory verses, and Bible themes. This CD-ROM based curriculum, has everything you need. Contents include leader's guide, lessons plans, skit scripts, activity pages, take-home parent pages, and power-point slides. Children will also enjoy the trading cards (sold separately) that correspond with each week's lesson. See The Story Trading Cards: Elementary for more information. - Publisher Help early elementary children experience God's great love by bringing his story to life Based on the thirty-one chapters found in The Story for Children, engaging lessons are formatted around relatable Scripture references, memory verses, and Bible themes. This CD-ROM based curriculum, has everything you need. Contents include leader's guide, lessons plans, skit scripts, activity pages, take-home parent pages, and power-point slides. Children will also enjoy the trading cards (sold separately) that correspond with each week's lesson. See The Story Trading Cards: Elementary for more information. 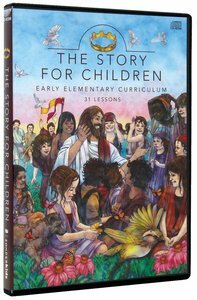 About "Early Elementary Curriculum (The Story Series)"
Help early elementary children experience God's great love by bringing his story to life Based on the thirty-one chapters found in The Story for Children, engaging lessons are formatted around relatable Scripture references, memory verses, and Bible themes. This CD-ROM based curriculum, has everything you need. Contents include leader's guide, lessons plans, skit scripts, activity pages, take-home parent pages, and power-point slides. Children will also enjoy the trading cards (sold separately) that correspond with each week's lesson. See The Story Trading Cards: Elementary for more information. Be inspired to see how your day-to-day story intersects with God's grand, overarching epic of everlasting redemption. Your journey of faith will come alive as you explore the divine narrative through New Testament and contemporary characters, and discover how the Bible reveals God's plan for you today. Order now to secure your copy when our stock arrives. Other edition is available. 9780829757927 0 Available. Expected to ship in 6 to 7 weeks from Australia.